This is my sixth post on using iPads in my classroom. In case you missed it, you can read Volume 1, Volume 2, Volume 3, Volume 4, and Volume 5 as well. In this post I'm going to share with you another project my students made using the Adobe Voice app. You may recall that I did a project last year (well, two school years ago) where students created a video ad for a French-speaking country using a green screen. I was really happy with that project, but I aimed to improve the project this year through the use of the iPads. The objective was to have students demonstrate speaking skills, digital citizenship, and cultural knowledge, through a short "commercial" for a French-speaking country using Adobe Voice. First, I showed students portions of each video from the playlist below, to get them acquainted with the scenery of each country they would have to choose from (I tried to pick a variety of countries all over the world). We also pointed each one out on the map. When students were done preparing the script, they got to start using Adobe Voice. One of the requirements of the project was that they had to include at least three cultural photos (but most included more). They could search in the app's library (which automatically uses Creative Commons photos and cites them for you), but if they couldn't find what they were looking for, they had to find an appropriate image to use legally and cite it properly, since these were being published to the internet. Since most students (people in general, for that matter) are unaware that photos that you find on the internet are not free to use without permission, I took this opportunity to teach students about Creative Commons. For those who aren't familiar, Creative Commons (or CC) is an organization providing a series of licenses that artists can apply to their work, giving permission for anyone to use it, as long as they follow the terms of the license (one of which is that credit must be given to the author). There are six different licenses, stipulating terms like whether or not the work can be used commercially or whether or not the work can be modified. 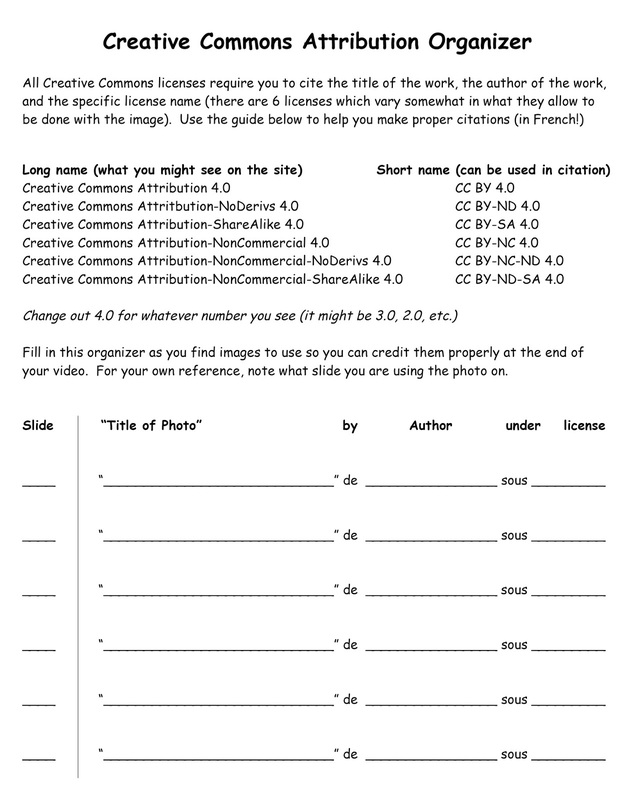 I advised students to use WikiMedia Commons to find their pictures, because most of the photos on there are either public domain or licensed through Creative Commons. Additionally, the licenses are very clearly noted on each photo. I gave the students another graphic organizer to note their photo sources as they went along. They then typed them into the credits slide at the end. Again, click the image to view the full size. Best practice attributions for Creative Common works contain the name of the work, the author of the work, and the specific license the work is under (which can be abbreviated; see above). Yes, I even made them write the attribution in French! It may look complicated and confusing, but almost all of the students did their citations correctly. Now, I'll readily admit that many of the students were skeptical of the premise that not all photos are legal to use, and that they would have to do all this elaborate citing. People rip off images all the time, and there don't appear to be any consequences (of course, sometimes there are, but rarely for personal use). What I tried to impress upon them, though, is that although you're not likely to face any legal consequences by sharing a copyrighted photo in your online project for school, it looks unprofessional and unscholarly. It's a good idea to start now leaving a clear footprint on the internet. 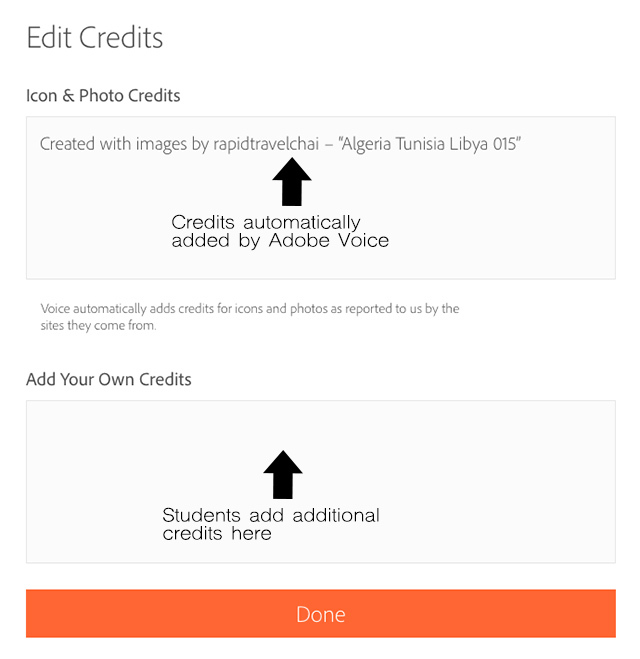 Above, when students hit the "export" button, they have an opportunity to add in credits. Below, you can save a link to the video to your clipboard and email it to yourself, or save the actual video to your camera roll if you want the file. I think this project improved upon last year's, and it once again turned the idea of a presentation into something more engaging. Below are some of the finished products. You can see more on my class blog. • It was a cool program and fun to use. • There was a lot of background noise, but this was solved by talking closer to the mic. • There were lots of buttons but it was easier to use than PowerPoint. • It was sometimes hard to find photos to use. • I learned about lots of francophone countries. • I would like to be able to present to the class as well. • I would like to have more time to have a deeper understanding of my country. 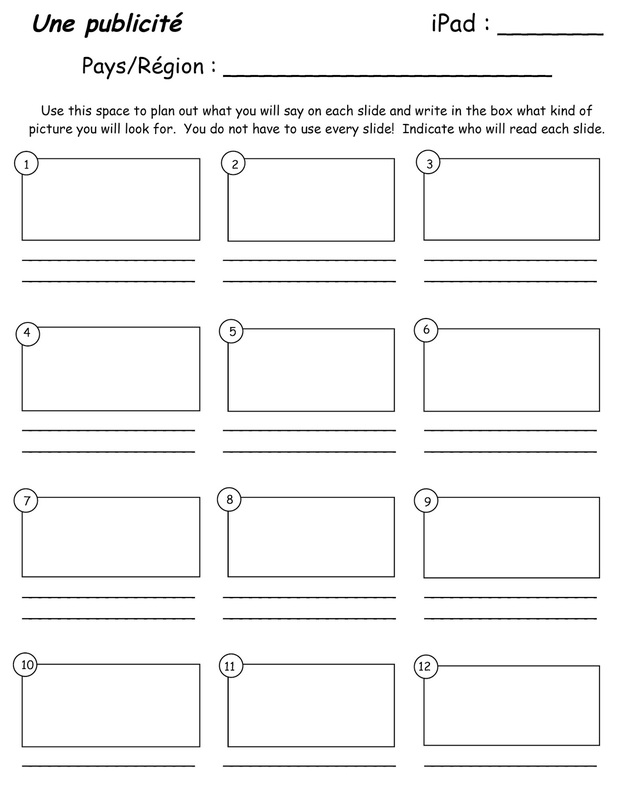 • Students could give each other feedback by stating two things they liked and one thing they would improve. • The automatic citing feature was great. Have you ever done a project like this or would you? What would you, or did you, do differently? Sharing our ideas and collaborating is what makes us better teachers, so please, share yours in the comments!